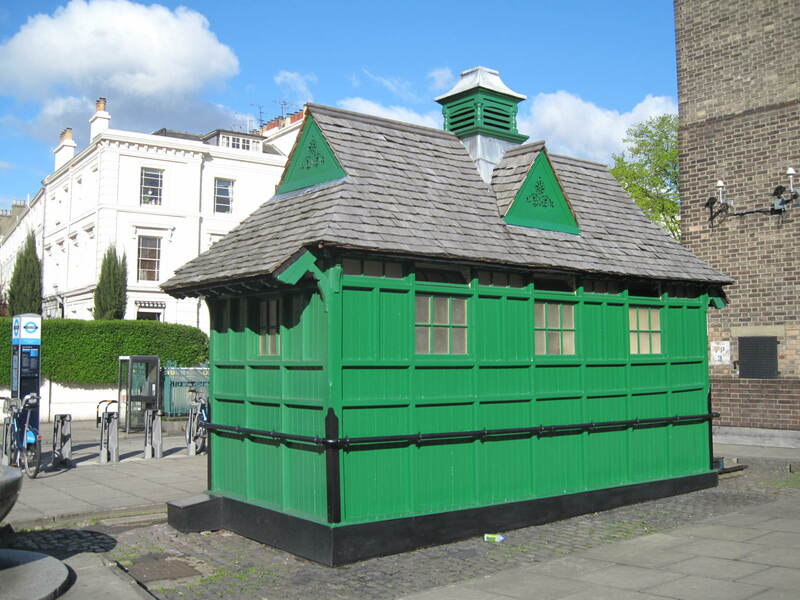 Only 13 of these little Green Cabmens’ Shelters remain and are listed by English Heritage. Twelve are open providing refreshments to all, only the Chelsea Embankment one remains closed. The shelters seem to take on the characteristics of the areas that they reside. The Sloane Street Shelter has a awning sponsored by top estate agent Winkworths protecting customers from the sun. The shelter gleams like a designer emporium with seasonal hanging baskets reflecting perhaps the Chelsea Flower Show. Kensington Gardens trees overhanging the All Nations have left the roof rustically bowed and mossy. While in St. John’s Wood, a stone’s throw from Regents Park, is surrounded by exotic potted plants. 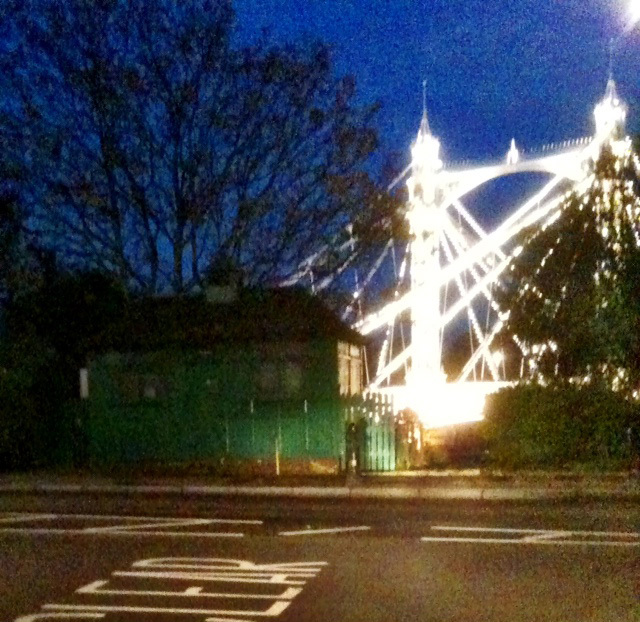 This shelter overlooking Albert Bridge has one of the most romantic locations for a greasy spoon. Nicknamed ‘The Pier’ due to its proximity to Cadogan Pier, it was, in the 1970s, also called ‘The Kremlin’ as it once had a clientele of left-wing cabbies. The Grosvenor Gardens Cabmen’s Shelter of 1906, was built for the Cabmen’s Shelter Fund (‘CSM’) to a modified version of Maximilian Clarke’s ‘ornamental’ design of 1882. Initially erected in 1906 on Hobart Place and later relocated to Grosvenor Gardens. Architectural interest: For its distinctive ornamental design and neatly detailed, well-executed carpentry work; as a fine example of a shelter erected by the Cabmen’s Shelter Fund to an early 20th century variant of Maximilian Clarke’s 1882 cabin design. Historic interest: As a rare and well-preserved relic of London’s hansom cab trade. Group value: With the adjacent public gardens and its Grade II* Rifle Brigade War Memorial and Grade II gates and gate piers, along with the terraces at 1-21 and 2-34 Grosvenor Gardens, which are listed Grade II. The Cabmen’s Shelter Fund was established in London in January 1875 ‘for the purpose of supplying Cabmen, when on the ranks, with a place of shelter where they can obtain good and wholesome refreshments at very moderate prices.’ In the late 19th century, the drivers of London’s horse-drawn hansom cabs were constantly exposed to the elements and were prohibited by law from leaving the rank when waiting for custom. Consequently, many took shelter in pubs between trips, which had a tendency to lead them to ‘drink more than is good for their health or behaviour’, as the Illustrated London News of 20th February 1875 reported. 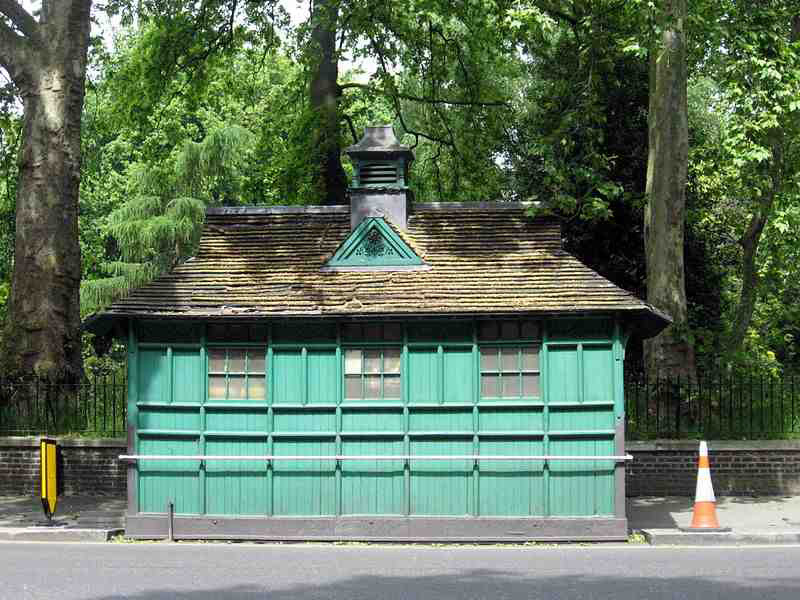 Under the presidency of the Earl of Shaftsbury, and with the support of the Prince of Wales (later Edward VII), the Duke of Westminster and the writer George Moore amongst others, the Fund began constructing small cabins along many major thoroughfares for the benefit of London’s cabmen. 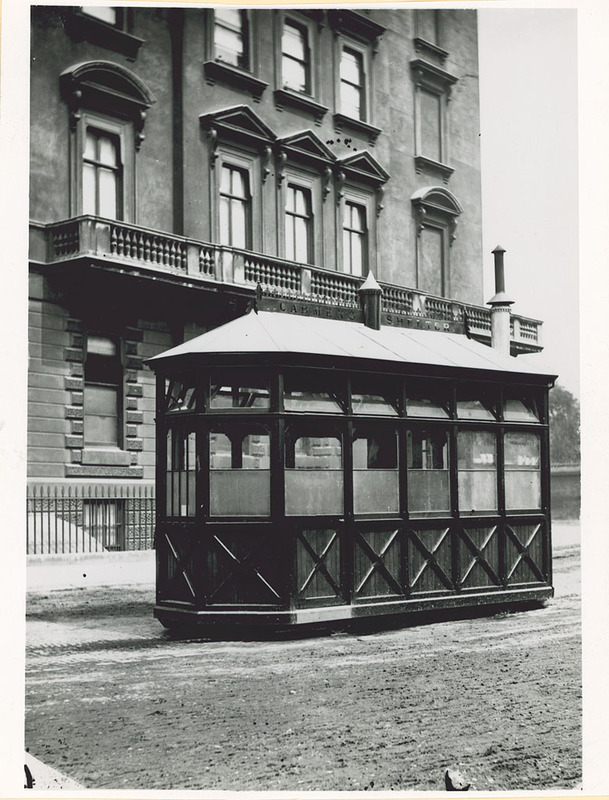 The first was a moveable shelter on Acacia Road in St John’s Wood. This was built in February 1875 to a simple design, consisting of a part-glazed timber panelled box with a shallow-pitched roof and canted end bays, without any notable decorative features. Later shelters designed by prominent architects became more sophisticated. In 1873, a larger cabin with improved facilities at Palace Yard was commissioned from Gibson and Maitland, the architects who had won first prize in a competition for a model shelter at Alexandra Palace. By 1879, George Aitchison was appointed as the first Honorary Architect to the Fund and a more ornate type of design was established. A long since lost example outside the Law Courts on the Strand (photographed in the late 19th century) with an ornate double-tiered hipped roof integrating a thin clerestory and decorative finials appear to reflect Aitchison’s influence. Also established under Aitchison was the standard rectangular framework, which was to be repeated with only minor alterations up to 1918. Some of these key design tropes were further developed by the architect Maximilian Clarke, who was responsible for the form of what became the most recognisable ‘ornamental’ shelter type. Following a competition in 1881, Clarke’s firm (Harvey and Clarke) were appointed to design a shelter for Northumberland Avenue (built 1882; replaced 1915). Key features of this design included a steeply pitched hipped roof with gablets and ornamental dormers, overhanging eaves with exposed rafters, a central louvred ventilation lantern and decorative fretwork panels integrated into the main timber frame which feature ribboned garlands and the ‘CSF’ monogram. These features became standard elements of the shelters built under Clarke’s direction, following his appointment alongside Aitchison as joint Honorary Architect to the Fund in 1884. The building of new shelters continued throughout the 1880s, though started to tail off towards the end of the century. Between 1890 and 1911 the focus shifted towards upkeep and repair of existing cabins and consequently only seven new structures were built over the period, this taking the operating number to its peak of 47. Owing to the relatively small number of new shelters being built around the turn of the century, there was no attempt to make anything more than modest alterations to the 1882 prototype, despite Clarke being succeeded as the Honorary architect in 1898 by M. Starmer Hack. The Grosvenor Garden example, which was originally erected on Hobart Place in 1906, reflects the longevity of the ‘ornamental’ model. The only notable modifications to the 1882 form being the simplified louvred boarding gablets (replacing decorative motifs) and some minor modifications to the proportions and detailing of the roof design. Over the course of the 20th century, many of the London cabmen’s shelters were lost. Owing to their positions in relatively exposed sites, generally, on or in the middle of key thoroughfares, the shelters were prone to damage from traffic and vandalism and also vulnerable to the impacts of metropolitan road-widening schemes. Of the 61 shelters built between 1875 and 1950, only 13 now survive. 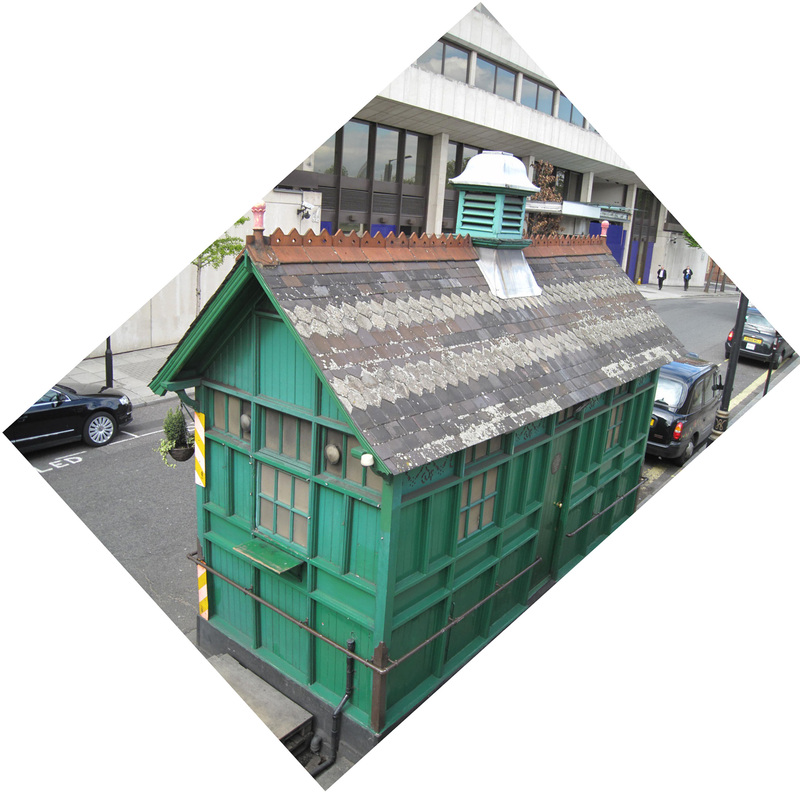 Included in this number is the Grosvenor Gardens shelter, which continues to serve London’s taxi cab drivers and is still overseen and maintained by the Cabmen’s Shelter Fund. Over the last 30 years, the internal fixtures and fittings have been largely modernised. Cabmen’s shelter first erected in 1906 on Hobart Place and later relocated to Grosvenor Gardens. A slightly modified version of the 1882 Maximilian Clarke ‘ornamental’ design for the Cabmen’s Shelter Fund. Materials: An oak frame with deal cladding (painted green) and an oak-shingle roof. Plan: Rectangular footprint, with an open-plan galley kitchen and communal cabmen’s mess area. Exterior: A single-storey shelter of seven main bays with three end bays, set on an elevated platform which straddles the pavement and the road. Horizontal and vertical members of the timber frame are expressed with panels of vertical boarding set between. The entrance door is on the north-east side with a central pivoting serving window from the kitchen galley to the north-west end. Square-headed, six-light windows with glazing bars and pivoting hopper lights above (mostly replacement frosted plastic glazing) are distributed evenly along both sides of the shelter; two sets to the entrance side flanking the entrance and a trio on the opposing side, of which the northern pair have been painted over. The south-east end has a set of three windows, matching those to the side elevations, occupying each of its bays. Fretwork panels bearing the ‘CSM’ monogram embellished with ribboned garlands are set below the eaves course, positioned alternately between window bays on the sides of the shelter. The roof is half-hipped and has overhanging eaves with exposed joists. Louvered gablets are set to the ends and to each side, and a square, louvred ventilation lantern with ornamental dormers in the centre of the ridge is capped with a tented rooflet. Interior: Internally the fittings are modern, although the basic arrangement of a galley kitchen and serving hatch with a cabmen’s communal section at the opposing end is still in evidence. Replacement bench tops and tongue-and-grove seat-back panelling feature in the communal section. A hatch to the ventilation lantern is retained in the centre of the ceiling. Reproduced by kind permission of the Rector of St. George’s Church, Hanover Square. St. George’s Church in Hanover Square has for many years given out small amounts of money to the homeless who sleep under the church’s portico at night. As in many parts of London the numbers of rough sleepers and other disadvantaged people has been increasing, and often this money is spent on alcohol or drugs, rather than on food and drink. The Cabmens’ shelter close by has had difficulties of late obscured as it is by the hoarding for ongoing construction work for Crossrail. The solution has been that the Vestry has now started to issue ‘refreshment coupons’ valued at £2 each, (facsimile above), which may be exchanged for food and drink at the shelter. The proprietress of the shelter is given funds in advance, and she accepts the coupons in lieu of payment for the excellent value meals she sells. Almost opposite the Albert Hall near to the site of the Great Exhibition of 1850 ‘All Nations’ refers to the diversity of visitors visiting the famous Victorian spectacle. This shelter was originally outside the Haymarket Theatre, the theatre that the shelter’s donor, Sir Squire Bancroft was then managing. It was later moved to Leicester Square where it spent some considerable time. 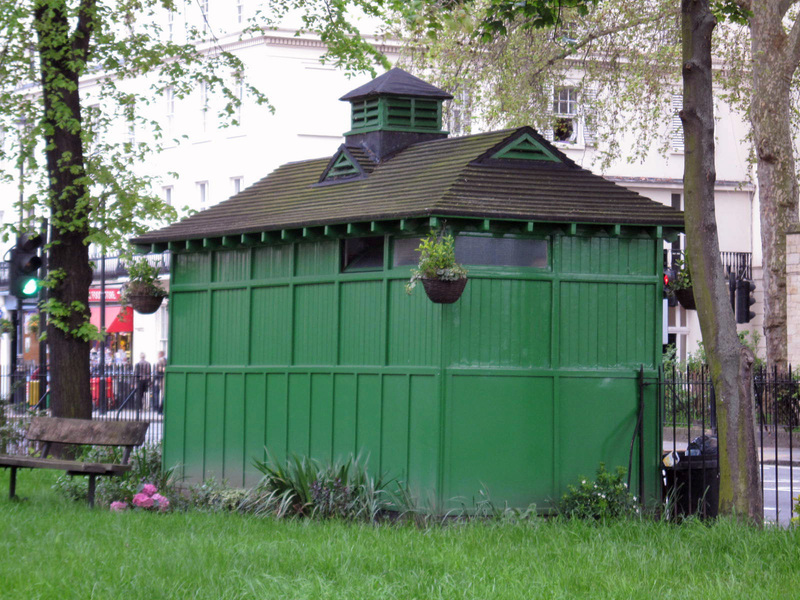 During this time, when the green hut was located in Leicester Square during the war, the siren was sounded and the diners made their way down to the underground air raid shelter. After the all clear, the cabbies made their way back to the shelter to finish what was left of their dinner. To their surprise, all their cabs had been destroyed by a German bomb. Amazingly, the shelter survived with just some superficial damage. It vanished in the late 1980s when pedestrianisation arrived and the shelter became obsolete. 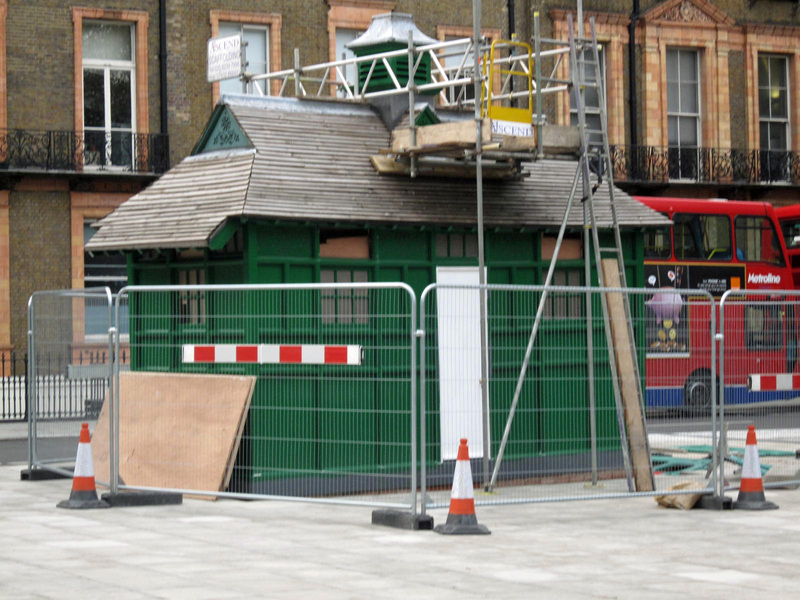 The decision was soon taken to move the shelter to Russell Square. 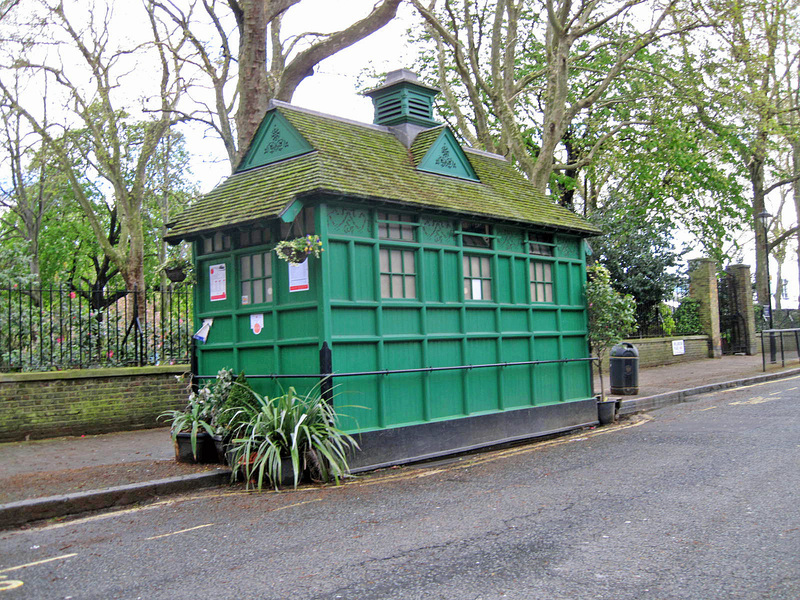 The shelter was restored in 1987 and again prior to the London 2012 Olympics when it was re-sited in the north-west corner of Russell Square. A plaque outside attests that this shelter was presented by Sir Squire Bancroft [pictured below] a famous actor/manager in 1901. The restoration of this shelter in 1987 for the Cabmen’s Shelter Fund was promoted by the Heritage of London Trust with generous assistance from the former Greater London Council, The Bedford Estate, The Swan Trust, Miss Hazel Wood and Brenda Bancroft and her family. In the 1960s developers knocked down four ancient streets running down to Temple Place to allow for a hotel to be built presumably so American tourists could see just the sort of roads they had destroyed. When the hotel reached completion the architects were amazed to find that just at the spot they’d planned to put their grand hotel entrance there was a green cabbie’s shelter. With typical corporate stupidity they tried to use their financial might to have the shelter removed by the authorities, but they were told that the shelter had been there since 1880 and was staying put. With the image of their rich American visitors being greeted by a ramshackle old shelter they were forced to beg for its removal. For a price the shelter was duly moved a few yards down the hill away from the hotel’s lobby. The green shelter is still there, but the hotel has since closed – awaiting redevelopment. Opposite the Victoria and Albert Museum this shelter derives its nickname from a pub which once stood on the opposite side of the road. 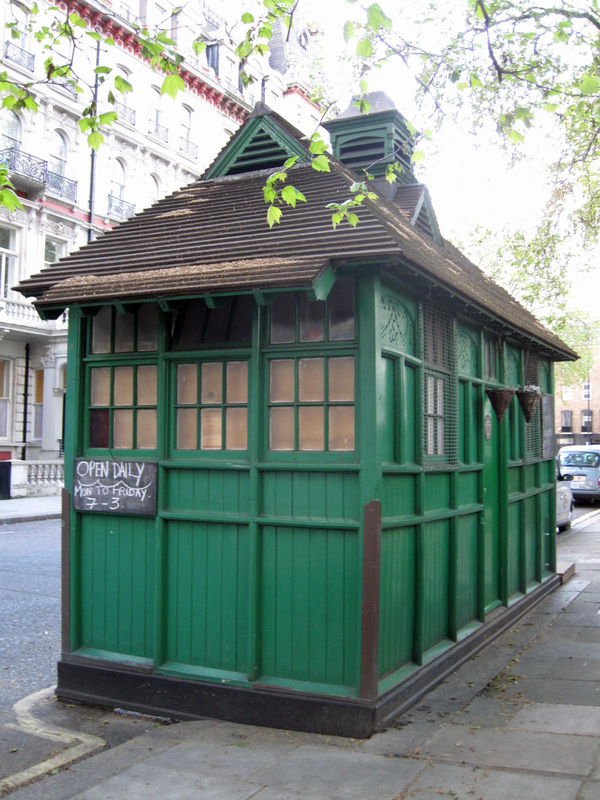 The Thurloe Place shelter is probably the successor to the 1904 shelter shown above and appears more substantial and slightly larger than the earlier shelter, suggesting that the standard design was gradually modified based on experience and customer feedback. The protective iron bollard at some point in its history seems to have suffered a collision hardly surprising as the shelter is positioned in the middle of one of London’s busiest roads. Surrounded by multi-million pound houses this newly refurbished shelter is located in Little Venice close to the Grand Union Canal. The proprietress Pat Carter featured on Ready, Steady, Cook alongside Ainsley Harriott. These are the current locations of the remaining green shelters.